Every time he turns at Centre Pass to survey the magnificent view down the Seaforth Valley to the Fiord, he wonders will it be the last time he gazes on such a magnificent view? It is the last thing you do, you should do it at least once. Steve will do it again and again. We have been ‘up the bush’ hiking or canoeing on a number of occasions lately: Steve designed a ‘nappy’ for a $20 raft to make it into a whitewater raft and had Della test it out (successfully) on Grade 2 water. 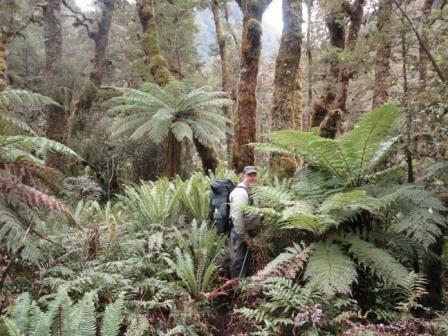 Photo: Steve Kintail Burn Dusky Track Fiordland NZ 2012.